Book your flights to Bangkok now and before long you could be enjoying vibrant city life, delicious south-East Asian cuisine and relaxing in one of the 5-star hotel spas. 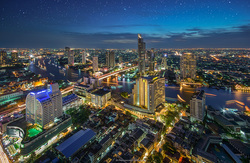 Bangkok has often been know as a party city for backpackers or as a stopover city on the way to Australasia, but if you think that's all Bangkok has to offer, you'd be very wrong. The city is alive at night with various markets although the market you really should visit is the Damnoen Saduak floating market during the day. Amongst the canals of Bangkok, locals sell their fruit and vegetables. 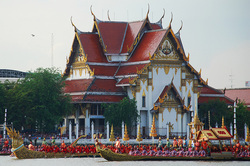 The city's temples are another must see on a trip to Bangkok. Calm and quiet in the mornings while the tourists are still waking up, these small areas of peace within such a busy city are welcomed. Be sure to visit the Wat Arun temple, simply one of the most beautiful temples in Bangkok. If it's Thai experiences you are after, for the food fanatics, the city is host to a number of recommended cooking schools, allowing you to learning how to create authentic Thai dishes such as Phad Thai and Khao Mok Kai during your stay. Alternatively if you're more of a fitness fanatic, head to one of the city's Muay Thai boxing schools to learn the art of this well known sports. If you've booked onward flights to other areas of Thailand, bangkoks main airport, suvarnabhumi is within easy access of the city. 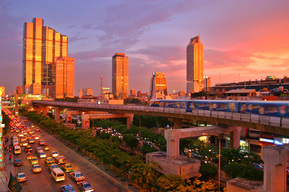 Take the express airport train before exploring the rest of Thailand. Head south to enjoy some of the most incredible beaches or north to discover the adventurous jungles. 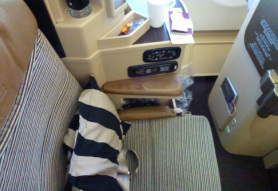 Direct flights to Bangkok from the UK are possible with a number of airlines including British Airways, Thai International Airways and Eva Air, indirect flights are also possible and can often be found for less than a direct Bangkok flight.